Peter, one of our humans, recently met a man from Wales. This is the ancestral homeland of Corgis so Bonnie and I were excited to hear the insights of the man from this wonderful land. Of Course, Peter had told this man that he lived with a Cardigan Welsh Corgi and a Pembrokeshire Welsh Corgi. The man had responded by calling us “posh dogs”. As all right thinking dogs would expect that was the end of the conversation. I have done research on this topic and it seems that many people, particularly in England and Wales regard Corgis as “posh dogs”. As any Corgi will tell you, we are herding dogs. Corgis were used to herd cows and other very very big animals. We used to herd them for long distances when the cows were being brought from the farm to the market place. I am pretty good and giving gentle nips to the ankles of my humans in order to help them move with a little more speed. This technique was used by the Corgis of wales as they herded cattle. The “posh dog” title comes from one particular Corgi breeder, Queen Elizabeth II. People seem to have the ridiculous idea that if the British Queen likes a particular breed of dog then it must be a “posh dog”. People call the Queen and her family, The Royal Family or The House of Windsor. Corgis call them The Family of Susan. Susan was a particularly wonderful Pembrokeshire Corgi who was introduced to Elizabeth II by her father on her 18 birthday. This was before Elizabeth became Queen and when this happened Susan became “Companion to the Queen”. She occupied this role until she died at the age of 16 years. By all accounts she did this job very well. In every creatures’ life there are incidents. A young pup may have several lifetimes worth of incidents but as we mature we get more of an idea as to what is expected of us. The historians who have studied Susan’s life have pointed to the incident when she bit a policeman. They seem to suggest this was some sort of scandal. I suggest it was not. Susan was 16 years old at that stage. This is the equivalent of about 100 years in human terms. The policeman could have been trying to harass her or she may have thought that this man wanted to depose the Queen and create a republic. Susan was a great supporter of the monarchy. We do not know exactly what happened but it is clear to us that Susan was justified in the action she had to take. What surprises me is that the policeman complained about a little nip from this very special dog. 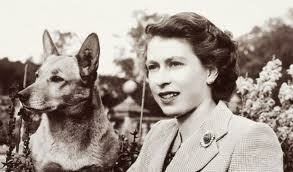 Almost all the Corgis which the Queen has had since Susan are descendants of this wonderful dog. A lot of the Pedigree Pembrokeshire Corgis are likely to be related to them through Susan. These came from the Rozavel Kennels and according to the Internet (which seems to know everything) most Corgis are descendants from these dogs. However, we know there were Corgis long before we were recognised as a breed and these dogs were all Pembrokeshire. Bonnie is a Pembrokeshire Corgi and is probably a distant relative of Susan. This entry was posted in Dog by Rusty. Bookmark the permalink.